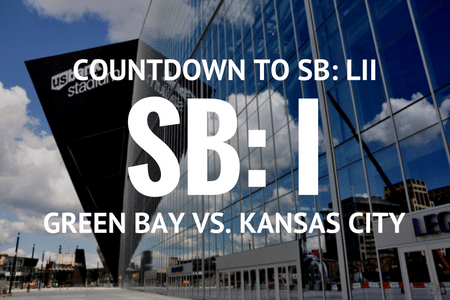 As team’s prepare to report for their training camps in a matter of weeks, we’re looking forward to Super Bowl LII in Minneapolis by counting down Super Bowls I through LI. The first ever AFL-NFL championship game in professional football, Super Bowl I was played on January 15, 1967 at the Los Angeles Memorial Coliseum in Los Angeles, California. An astounding 61,946 fans were in attendance for the first ever Super Bowl, the big game that will return to the city of Los Angeles in 2022 for Super Bowl LVI. The Green Bay Packers and Kansas City Chiefs were the first two Super Bowl participants. In the first half of the game, the Chiefs would jump out to a quick lead and take control of the game early. However, in the second half, things would pull a little more even thanks to a 50-yard interception return by Packers defensive back Willie Wood and a memorable performance by Packers quarterback Bart Starr. Starr, who would go on to be named Super Bowl I MVP, would lead the Packers to a 35-10 victory, throwing for two touchdowns and completing 16 of his 23 pass attempts. An interesting fact about Super Bowl I is that it was broadcast nationally by two networks simultaneously, being shown on both NBC and CBS in 1967. There was no Katy Perry or Lady Gaga with a flashy halftime performance, but rather fans were entertained at halftime by a mix of various college bands and musicians from the universities of both Arizona and Michigan.